Linda showcases a selection of her newest basket designs. Linda Awinyure Atia is a basket weaver from Vea, Bongo District, Upper East Region of Ghana. Today, she’s hard at work at one of her signature designs. Sitting comfortably on a red mat, she deftly weaves natural and black-dyed straw into a beautiful checkered basket. It’s part of the fresh stock she’s preparing for an upcoming trade fair in nearby Bolgatanga – her most lucrative week of the year. Linda worked hard to provide for her children, but she knew she would need to find another source of income to give them a good future. She joined a basket weaving group run by CFTC partner TradeAID Integrated, where she learned much more than just the art of weaving. It’s this last skill that’s become so invaluable to Linda and the other women in her group. Linda (on the bottom left), shares a smile with her basket weaving group. 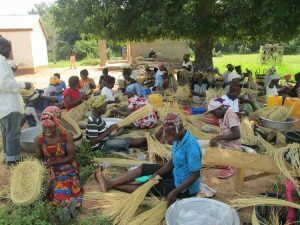 Through TradeAID Integrated, they have access to the fair trade markets in nearby Bolgatanga. In 2014, Bolgatanga, known as the “craft capital of northern Ghana” became the second Fair Trade Town in Africa. 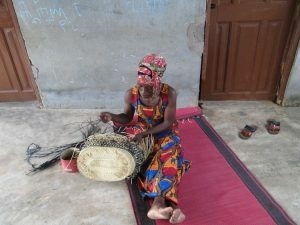 Linda notes that since then, people from all over the world have been attracted to Bolgatanga, many of whom buy her baskets. “Fair trade is important to me because it helps get a fair price for my products and exposes them to a larger market,” she explains. It also gives her the chance to network with other basket weavers, sharing information on inputs, market access and new basket designs. She also has the opportunity to showcase her work at the annual Bolgatanga International Craft and Arts Fair. In her first year, she had record breaking personal sales, and her group attracted the attention of a buyer. Linda weaves a new basket in preparation for the upcoming fair trade show. “Since I started basket weaving, my children’s lives have changed,” Linda told us. 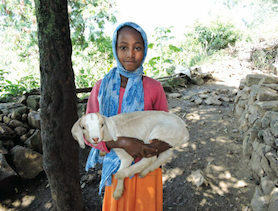 Through fair trade, she gets more income from her sales than she would earn otherwise. Her children eat well throughout the year, go to school with all the supplies they need, and their health care needs are met. 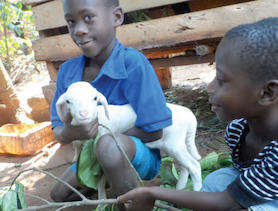 “These things give them the peace to learn better at school,” she told us with satisfaction. But she wants to go even further. 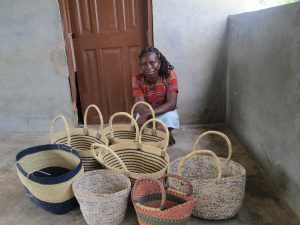 Linda now plans to scale up her basket business and diversify her sources of income. 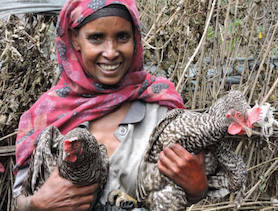 She’s investing in her farm and her dressmaking business to make them more profitable. Thanks to her determination, and the support of caring Canadians, Linda is poised to take her business to a new level in the new year – a fresh new start for her and her family.